Bottle lights look wonderful on your porch, lunai, 3-season room, or in the family room. They are made from recycled wine bottles that have had the bottom removed. 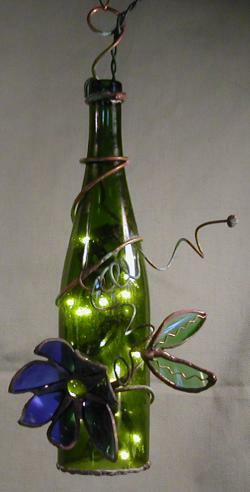 The copper wire wrap holds a broken bottle flower and leaves. The flower and leaves are made from borken wine bottles or vases that have been reshaped and put back together to form the curve of the flower. Inside the bottle is a 20-light string of indoor/outdoor lights. The clear bottles [2nd from left] have multi-colored lights while the others contain white lights. The mosaic bottle light [far right] is one of our newest items. The clear wine bottle is coverd with mosaic made from broken pieces of auto window glass that has been painted with glass paint creating a soft glow from the 20 white lights inside. 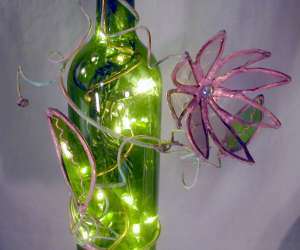 Available now (pictures soming soon) are night lights made from auto window glass mosaic and both styles of bottle lights are available to sit rather than hang with the cord coming out the bottom of the bottle. Bottle lights are $42 each + shipping/handling ranges from $14 to $18. 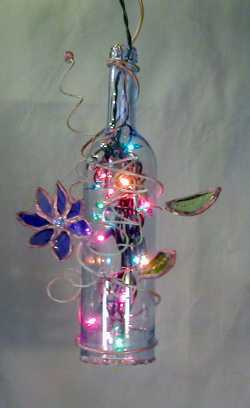 Mosaic bottle lights are $55 each + shipping/handling ranges from $15 to $20.